"The time was 6:30 p.m., June 25, 1927. St. Joseph, Missouri citizens-factory workers, packing plant employees, professionals-arrived in Model T Fords, Stanley Steamers, Pierce Arrows or hurried on foot up the sidewalk to the seventh block of Edmond Street for the gala opening of the city's $1 million, 1,200-seat "Movie Palace." The air was electric with excitement..."
The Missouri Theater opened June 25, 1927 with Rough House Rosie as the feature. 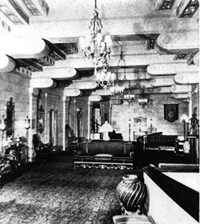 Waylande Gregory designed and created all the sculptural work in the theater in 1926 and 1927. CLICK HERE to learn more about Waylande Gregory. After paying their 25 cents admission, guests were astounded at the theater's intricate beauty. The silent film showing that evening must have paled in comparison to the theater's plush seats, ornate chandelier and exquisite plaster work. Though silent films are long past for the theater, this sense of awe returns each time a local theater group, national performer or arts program takes its stage. Designed by Boller Brothers, the Missouri Theater's unique structure was added to the national Register of Historic Places in 1979. While movie palaces across the country were being torn down to make room for contemporary structures, the citizens of St. Joseph refused to allow destruction of one of the country's few examples of Hollywood-Oriental style. 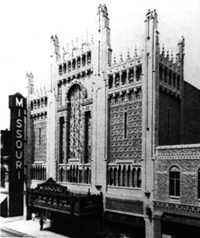 CLICK HERE to open a PDF file that contains some old newspaper clippings regarding the Missouri Theater and its grand opening in 1927. A $1.9 million renovation project, designed by St. Joseph-based Ellison-Auxier Architects, Inc., began in September, 2001 and was completed in March, 2002. Fresh carpet, repaired plaster, cleaned seat upholstery and remodeled dressing rooms were among the scheduled projects. Restroom facilities were added and handicapped accessibility was improved. Upgraded lighting and sound systems also contribute to visitors' enjoyment. Funding for the restorations came from the 1998 Capital Improvement Sales Tax, a five-year, half-cent tax program. In 2013 the theater is slated for more renovations including new lighting and rigging systems. Funding for the continued restoration comes from the 2005 Capital Improvement Sales Tax. Early morning, on February 19, 2011 a fire broke out in the Missouri Theater complex, in the northeast corner of the second floor, used by Robidoux Resident Theater as their costume shop. Three fire doors failed to shut, allowing extensive amounts of smoke to damage the theater. Two local businesses became uninhabitable, and several arts agency offices were forced to temporarily relocate. Luckily no shows had to be rescheduled, and the Missouri Theater opened mid-May of 2011. • The eight lobby doors were replaced with new insulated doors (old ones were wood) and painted. 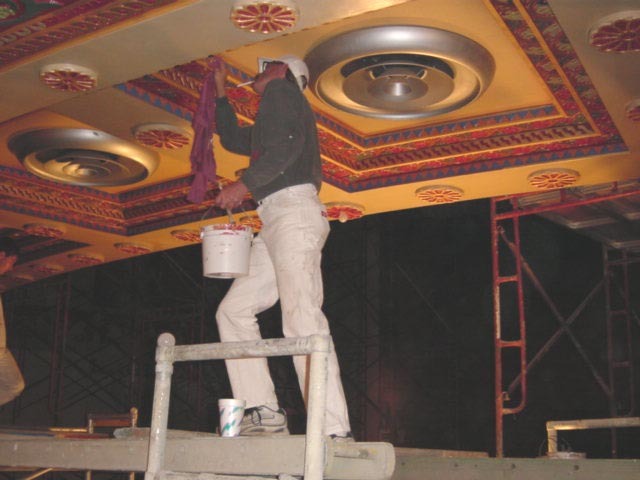 • Extensive plaster patching throughout the theater to repair crack and crumbling interior walls. • The drinking fountain was restored to it’s original appearance and updated with a chiller added. • Wood doors were removed from theater entrance (inside by lobby) and replaced with drapes. • A new permanent mixer board is being installed at the back of the theater in the sound monitoring position. • All new carpet both upstairs and downstairs along with the Mezzanine. • The entire interior of the theater has been repainted to match it’s original colors. • The green room (ready room under the stage) was repainted and carpeted. • A vinyl covering was installed in the stairways by the dressing rooms. • 2 new marquee signs at the entrance of the theater. • Seats were all steam cleaned. • Women’s and Men’s restrooms on Mezzanine redesigned, enlarged, painted, papered, new flooring and all new fixtures. • All lighting repaired or replaced. • The sound system will be totally replaced. • A sound shell was purchased for the stage. • A new masonite surface was put on the stage floor. • New roof vents and heating system repairs. • 2 new boilers to replace the old boiler. • A sprinkler system was installed. • A new coat-check room was created on the Mezzanine. • 2 New chandeliers as you enter the lobby were presented to the theater by Friends of the Theater, and are supposed to match the original lights that were there.